It's official - Happy Autumn! It's my favorite season, and I spend every scorching hot Texas summer eagerly awaiting the cooler temperatures and the falling leaves. Unfortunately, it looks like I'm going to have to keep waiting since the highs here in Austin continue to remain in the 90s. Ugh. Oh well, even if I can't yet enjoy falling autumn leaves in real life, I can play with them on my computer. I recently found this leafy graphic on Freepik.com, and just had to create a digital paper set with it. Just click the image above to download. 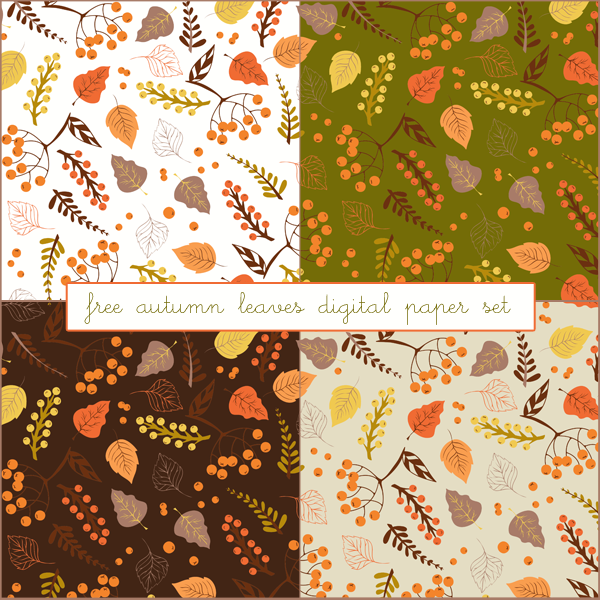 Feel free to use these papers for any fall-themed of Thanksgiving scrapbooking, crafting and digital design projects. Also, I'd love for you to send me a photo or link to your creations. Nothing makes me happier than seeing the amazing things people create with Just Peachy papers! Happy Autumn! To see more digital papers for purchase, just follow this link to our Just Peachy Digitals shop. Good post. I find out something new and difficult on personal blogs I stumbleupon each day.